ith a commitment which India has made to its reforms agenda, a pledge has been presented for a “responsible” Budget for the fiscal year 2013-14 Finance Minister P. Chidambaram has acknowledged that the “ball was in the government’s court” in order to revive the financial growth. In response to Reserve Bank of India having decided to cut the repo rate and cash reserve ratio by 0.25 percent, Mr. Chidambaram has expressed his welcoming to this decision of RBI Governor D. Subbarao. Now with Mr. Chidambaram’s annual budget statement due in late February, all are watching in order to see how the government plans to put its finances in order. here is a big advantage which India has over China as of the moment in the global labour market and that is its young and English speaking workforce who have shown to be more important on the global level as per the leading human resource ounsultancy giant Manpower Group. According to the President of Manpower Group, David Arkless “the Indian government and companies though need to focus on understanding the skill sets which they would require in the future in order to train the country’s young population in order to maintain the supply-demand balance of the job market.” Mr. Arkless does not view India to be the typical emerging market economy, because the specific talent market and Indian economy operates in a different manner from that of the Chinese or any other market or global growth economy. fter having decreased in the last four trading sessions, Reliance Industries Shares India’s most valued stock, were among the top gainers on the 50- share Nifty benchmark as of Jan 30th as it traded 2 percent higher at Rs.900 on the Bombay Stock Exchange outperforming the broader BSE oil and gas index and here is as to why. Firstly, with the value buying, the stock has lost 4.3 percent over the last four sessions, attracting long term investors. Secondly, with the ewly formed Cabinet Committee on investment may clear the 47 oil & gas blocks, including RIL’s producing KG-D6 gas fields, where defense approval has either been withdrawn. Thirdly, RIL has successfully raised $800 million via a perpetual bond sale at 5.875 percent coupon which is the first senior long rated bond issuance by a domestic company. he new guidelines for the fresh auction of the secondgeneration (2G) spectrum of one of India’s leading telecom operators Vodafone has beend eemed to be illegal as they were discriminatory in nature. According to the Department of Telecommunications, the spectrum prices have been fixed at arbitrarily high levels which are much higher than the international benchmarks. GSM Spectrum in key circles such as Delhi, Mumbai, Rajasthan and Karnataka had found no bidders, while the CDMA spectrum was not auctioned after two interested parties – Tata Teleservices and Videocon – withdrew from the auction. On March 11th an auction will be held where airwaves in 1800MHz and the 900MHz bandwith of the GSM Spectrum will be bid for first, followed by the CDMA airwaves in the 800 MHz bandwith. he Toyota Motor Corp has resumed the domestic auto production as of Jan 28th for the first time since the earthquake and tsunami. According to Nikkei business daily assembly lines have been started up at two plants that make three hybrid models. President Akio Toyoda said that he had faced numerous crisis, but the record quake and resulting tsunami “dwarfed them all,” Nikkei reported when Toyoda was aken aback by the horrid reports from various divisions soon after the disaster had struck northeastern Japan. Each business partner that had sustained damage was represented by a red pin on a map of northeastern Japan. The company was finally able to resume production at its plants in Tsutsumi in Aichi Prefecture and Miyawaka in Fukuoka Prefecture on Jan 28th helping the red pins to decrease. verseas investors were keen in the regional stocks as the rupee strengthened over the three month high at Rs.53.36 on the back of increased dollar inflow and the upcoming disinvestment in public sector companies. “Sensex gained marginally by 14 points to close at above 20,000. Markets were range bound and action was stock specific ahead of January F&Q expiry. PSU banks witnessed sharp declines after ower than expected quarterly result and lack of continuity in the future direction of RBI interest rate policy,” according to Shubham Agarwal, Associate VP & Sr Technical Equities Analyst, Motilal Oswal Securities Ltd.
harti Airtel has announced that Manoj Kohli who was previously the CEO of International Operations will be appointed as the new Managing Director of Bharti Airtel thus extending a management restructuring exercise precisiley aimed at reviving the growth at the world’s No. 4 cellular carrier by customers. Kohli, a company veteran currently heads Bharti Airtel’s international operations as its chief executive officer and is also a joint managing director of the company. Sunil Mittal had been holding the post earlier, now Mittal will be the executive Chairman of the company. Gopal Vittal, who will take over as the CEO of Airtel’s India operations will be appointed as Joint Managing Director on Bharti’s board. "Entrepreneurship can develop only in a society in which cultural norms permit variability in the choice of paths of life." a society in which cultural norms permit variability in the choice of paths of life." Paradoxically, the breakdown of the caste system in modern times led, not to the flowering of entrepreneurial talent, but instead to a keen desire among the newly educated classes to acquire professional qualifications as a means of securing well-paid jobs. This was perhaps the outcome of the way our political and economic system evolved in the days after Independence, with its emphasis on egalitarianism and overriding faith in public sector enterprises to promote prosperity. This socialist model now widely recognised as a failure because it only served to reinforce our poverty even as many of our Asian peers sped past us to become developed countries in their own right. Since then, particularly after the reforms of 1991, efforts have focused on changing the mindset in India regarding entrepreneurship and on creating entrepreneurs by giving people (especially the younger generation) the self confidence to become high achievers. However, problems remain, especially in our attitude to failure which is unchanged. As a people, we still believe that it is better to have not tried than to have tried and failed. We do not have an appetite for risk and we don’t appreciate the simple truth that there can be no entrepreneurship without risk-taking. Indeed, our general aversion to risk—the comfort we draw from the safe path, or the tried and tested—remains the most serious impediment to the flowering of an entrepreneurial culture in the country. et me join the Unique Times team in wishing all of you a very happy and prosperous New year 2013. New year celebrations reminds us that one more year is over . It is a time when many people take stock of their positions and achievements and more importantly plan for the coming year. New year also reminds me that the calendar year has come to a close and soon the financial year too will be coming to a close. Every year during January I am under pressure from my human resource department to provide details of my income tax calculations with documentary evidences. It is the time when I actually start calculating my taxes and do the tax planning exercise and investments. falls under the 30% tax bucket. If the depositor requires periodic cash flows interest can be collected on a monthly/ quarterly/ half yearly / yearly basis. The customer can also choose for a lump sum payment at the time of maturity , in which case the interest would be compounded on a quarterly basis. Interest on tax saving deposits is liable to tax under the Act. If the interest received by the depositor exceeds Rs 10,000 per branch of a bank during a financial year tax deduction at source will be applicable. Nomination facility is available and can be made or modified at any time during the tenor of the deposit. Almost all scheduled banks have come up with tax savings deposits schemes in conformity with the notifications issued by the government and the same is being offered through all the branches. Geographical proximity for investing, simplified account opening procedures, non existence of any charges, safety attached to banks deposit and attractive returns definitely makes tax savings deposit schemes offered by scheduled banks a very attractive option for tax saving. your business YOU KNOW IT Most of the successful entrepreneurs tell this story. Long before they were running multimillion-dollar companies, they were testing their entrepreneurial skills by selling lemonade on the corner and other activities. It seems that behind every successful businessman there is a kid who knew that doing business is their life plan. There is something that sets every entrepreneur apart, something that makes them believe that their life is destined for something different. Entrepreneurs have that x factor that makes them ride on the highs and lows of the life, and to accept failure and success with equal poise. The entrepreneurial spirit is a gift that inspires others to become the best they can be. From passion and positivity to leadership and ambition, here are the entrepreneurs that best define the entrepreneurial spirit. PASSIONATE Entrepreneurs are passionate about their work. It is the fiery passion to their work that makes them successful. Richard Branson the founder of Virgin embodies this quality. Virgin group has expanded worldwide in industries ranging from music, to space travel. "Businesses are like buses," he once said. "There's always another one coming." It is not just the passion for business, but it is also the passion for business. Branson attracts a lot of media attention because of his lifestyle and way of doing business. "There's always another one coming"
ADAPTABILITY Adaptability is always important for an entrepreneur. The entrepreneur must be willing to adapt to the changing environment and improve his skills. From a service point of view he must willing to improve to the satisfaction of the customers. Sergey Brin and Larry Page of Google are a great example of adaptability and leading the way. These frontrunners see change way ahead and adapt their business according to its. Their ability to deliver products way ahead in time makes Google one of the most powerful companies in the world. AMBITION An entrepreneur also needs to be ambitious, without ambition nothing can be achieved. Debbi Fields, a young homemaker didnâ&#x20AC;&#x2122;t have any resources or business knowledge, but she had the ambition and a great chocolate chip cookie recipe. When she first opened her cookie outlet in 1977, everybody thought that she was crazy. Only because her ambition she has transformed her little cookie store into a $ 450 million company across many nations. OPTIMISTIC LEADERSHIP An entrepreneur should be a leader too. He will require the Charisma, ethics and integrity. The entrepreneur should also be enthusiastic, team oriented and guide. Mary Kay Ash of Mary Kay Cosmetics had all these in her. She infact helped a half a million women entrepreneurs fulfil their dreams of owning a business. She was a single mother who worked for a home products company. She started her own company because her company in 1963 with $5000 . She was a powerful motivator and leader. She was named one of the 25 most influential business leaders in the last 35 years. There are always ups and downs in life and even in business and the entrepreneur needs to take this challenge. Jeff Bezos the founder of Amazon is well known for his positive attitude to business and life. Living by the motto that "every challenge is an opportunity," Bezos set out to create the biggest bookstore in the world with a little internet startup called Amazon. Amazon.com was launched in July 1995, and with no press, managed to sell $20,000 a week within two months. The dotcom bubble caught up his startup and its shares plunged for $100 to $ 6. But Bezos strongly came back fighting. Now Amazon.com is a multi billion dollar company, all because of the optimism of its founder. lackBerry 10 is the next generation proprietary mobile operating system, developed by BlackBerry Limited for its BlackBerry line of Smartphone and tablet handheld devices. It is based on QNX which was acquired by BlackBerry in April 2010. The platform was originally called BBX but this was changed when BlackBerry was blocked from using the BBX trademark after legal action from BASIS International, who already uses it for their software. BlackBerry CEO, Thorsten Heins, has said that the company is considering licensing BB 10 to other OEMs. Two BlackBerry 10 Smartphones are scheduled to be released in Q1 of 2013. On November 12, 2012, Heins announced a January 30, 2013 launch of the BB10 system. P's Envy TouchSmart Ultrabook 4 is an attractive ultrabook with a respectable mix of components for its price, a responsive touch screen, and a backlit keyboard. The Envy TouchSmart 4 isn't very configurable, so you can't make it too much more powerful than it already is. It's on the heavy side for an "ultrabook" Its touch pad is jumpy at default settings. The HP Envy TouchSmart Ultrabook 4 is a good gateway to the Windows 8 experience with a responsive touch screen in a traditional laptop body. With a standard set of ultrabook specs, a relatively thick, weighty chassis, and a 1366 x 768 screen, the 14-inch laptop is a head turner and as said before a good laptop to test the Windows 8 experience. he Samsung ATIV Smart PC is a tablet and a laptop together. It’s got a nearly full-size keyboard, but the keyboard is included as a detachable accessory. The slender tablet, just 9.9mm thin, is only three ounces heavier than an iPad. The ATIV Smart PC is really a sign of things to come. The Smart PC’s performance as a laptop leaves a lot to be desired, but it keeps up pretty well with the current crop of ARM-based tablets, both Android and iOS. But you can still dock it to its keyboard, carry it around and use it as a standard clamshell laptop. It also runs the full version of Windows 8, not the semi-crippled Windows RT that runs on Microsoft’s Surface RT. But it’s Clover Trail processor is 32-bit only, and while it’s fine for web browsing, email and light duty office chores, be advised you’d never mistake it for a full-featured laptop. he Canon EOS-1D X is a 18.1 effective megapixels full-frame DSLR. The camera is capable of acquiring video at HD resolution (1920 x 1080 pixels) at frame rates of 24, 25 and 30 fps or 720p (1280x720) at 50 or 60 fps, and SDTV (640Ă&#x2014;480) at 25 or 30 fps. The h.264 video can be switched between all inter frame and IPB with bidirectional prediction to reduce file size. The EOS-1D X has two DIGIC 5+ image processors for sensor reading and compression, and a separate DIGIC 4 dedicated to automatic exposure. It was officially released on 20 June 2012. Like the Canon EOS 5D Mark III and Canon EOS-1D C, the camera features 61 autofocus points, which are assisted by a 100,000-pixel metering sensor. hen the Sun strikes in India, its first shines upon Arunachalâ&#x20AC;&#x2122;s wild jungles and tribal communities. Arunachal the name means the land of rising Sun. Arunachal Pradesh, a serene land tucked into the North Eastern tip of India. The land stretches from the foothills of the Eastern Himalayas to their peaks, invites you to relax in its picturesque hills and valleys, enjoy its salubrious climate and meet its simple and hospitable people, with their glorious heritage of arts and crafts and colourful festivals that reflect their ancient faith in the inexorable. Arunachal is one of the most sparsely populated states of India, bordered by China, Bhutan and Myanmar. The state is the home of the complex mix of various communities, who are friendly, colourful and simple people. The rich flora ranges from the Alpine to the subtropical, from rhododendrons to orchids. Its verdant forests, tumultuous streams, condescending mountains and snow clad peaks make it a unique destination. Arunachal Pradesh is considered to be the Nature 's treasure house and home to orchids, known for their elegantly beautiful blooms, from one of the leading region with more than six hundred species, growing in different elevations and climatic conditions throughout the state. The age old monasteries and gumphas, sacred lakes, ruins of forts & palaces, beautiful and ever smiling people with graceful hospitality will greet you, throughout your sojourn in the state. The capital of the state, Itanagar is scattered with light, earthquake-proof, wooden-framed buildings rising up the slopes of green hills. Traditional huts are strewn amongst the more recent constructions. The residence of the Governor crowns one peak while a new Buddhist Temple crowns the other. Between them lie administrative officers, shops, daily bazaars and thatched houses. Important Tourist Spots Tawang the land of the Monpa and Sherdukpen tribes with centuries-old monastery, Dragon gates, hundred pristine lakes and numerous waterfalls, situated high up in the misty-eyed Eastern Himalaya. The true beauty lies in the unhampered vistas, the serenity of its lakes, restlessness of the brooks, and the spiritual fragrance and ever smiling people. The soggy, rocky mountains, snowcapped summits and old Monasteries looming large on the skyline, are the real treasures of the place. The township stands on the spur of a hill over 12,000 ft above the sea level. It is the major centre of the Mahayana Buddhist and the headquarters of Tawang district. Tawang is famous for its 400 years old Buddhist Monastery locally called Gumpha. It is the fountainhead of spiritual life of the followers of the Gellupa sect of the Mahayana school of Buddhism. The Tawang Monastery is associated with the famous Torgva festival which is held in the eleventh Monpa month called the Dawa Chukchipah during Dec-Jan as per the Buddhist Calendar. There is an 8 meter high gilded statue of Lord Buddha here. A must visit is the craft centre which produces very fine woollen carpets of colourful designs and masks. Se La Pass, Lies on the way to Tawang .The World's Second highest Pass, the Sela Pass at 4,125 meters, which runs through a small ridge and along a placid lake called the Paradise Lake , in India. The highest pass of the state of Arunachal Pradesh and the third highest in the world is a wonderful place to visit. Pakang Teng Tso Lake, the spectacular lake lies at about 17km from Tawang and a dazzling example of the hidden treasure amidst the vast green vegetation. Bomdila is the headquarters of West Kameng district is situated at a height of 2,530 metres. Offers spectacular panoramic views of Himalayan landscapes and snow clad mountains, lies amidst apple orchards, wild orchids, forests and cascading waterfalls. This area has had strong Tibetan and Buddhist influences over many centuries and hence there are many Buddhist monasteries called 'Gumphas' here. There is a craft centre here which produces very fine carpets of colourful designs and masks. Other places of interest here are apple orchards and the Ethnographic Museum. Bhalukpong is a beautiful picnic spot was the capital of Bhaluka, the grandson of King Bana. This beautiful place lies at 64km from Tezpur on the foot of Aka Hills (Arunachal Pradesh). The remains of the fortification of the kings are still visible. Colourful utility items like cups, dishes and fruit bowls scooped out of local Monpa wood.Sherdukpen shawls, Apatani Jackets and scarves Adi skirts, Mishmi shawls, Wancho bags Baskets and masks made of bamboo and cane Ornaments and bangles made of beads Although you cannot find plush air-conditioned city-like shopping malls, there are Government Emporia as well as private shops to make your shopping in Arunachal Pradesh easy. Bargaining with the vendors on the main streets may also appear delightful experience. Carpet making is one of the major occupations in the District of Tawang, West Kameng, Changlang and Upper Siang, Arunachal Pradesh. Mostly women are engaged in carpet making in Tawang. Arunachal Pradesh carpet has been acclaimed National & International repute by considering the quality of carpet weaving in different motive and design. Carpet making is a specialty of the Monpa tribes of Arunachal Pradesh and with an increase in demand, production of the carpets is now being undertaken on a large scale. A part of carpets other items in the same form of carpets are produced here such as wall hanging, cushion pad, telephone pad, floor covering etc. How to Reach By Air: The nearest Airport is Lilabari in Assam, 57 km from Nahariagun and 67 km from Itanagar. By Rail: Nearest Railway station is Harrmoty in Assam. 23 km from Naharlagun and 33 km from ltanagar. The station is served by Arunachal Express. By Road: Itanagar is connected by daily bus service from Guwahati and the other cities of Assam. Arunachal State Transport buses are plying throughout Arunahcal, Assam and Meghalaya. For an amazing holiday, you need to go to an amazing destination. So if you are seeking to step into a world of extraordinary beauty and discover experiences found nowhere else on earth, Arunachal Pradesh is the place for you. Go and enjoy the salubrious climate and discover the intriguing traditions of ancient lifestyles of 26 tribes and 110 sub tribes. Host to many vibrant and colourful festivals, this Himalayan state offers an experience like no other which is why once you visit, you will come back time and time againâ&#x20AC;Śâ&#x20AC;Ś. My teeth have stains on the inside and sides. I do not smoke or use any form of tobacco. In spite of brushing twice daily I keep on getting these stains. Can you suggest me some treatment? Please tell me how to avoid these. A: Stains on teeth can be of different reasons from use of tobacco, smoking, colored food and beverages etc. But In your case we suspect bacterial stain as there is no substance abuse or vices. The other reason can be increase in the chromatic ions in the drinking water. Both of these can be reduced by a proper professional cleaning and polishing by a dentist by using piezoelectric scalers and prophylactic spray. These stains will reduce the incidence if a regular cleaning is done. My daughter is 10 years old. She has forwardly placed upper teeth. She had been taken to a dentistwho told that she had small lower jaw which is causing the problem. Why is it caused? Is it due to calcium deficiency? Is there any treatment to avoid surgery in the later stage? Set by the sterling backwaters of Kerala, a magnum opus by an earnest entrepreneur, here nature meets modern architecture, here hospitality is draped a newer attire. Vasundhara Sarovar Premiere is the latest addition of Five Star space into Kerala's amazing tourist scenario. Unique Times team takes a journey to this five star opulence, to savor the beauty of the nature and relax for a day. What awaited us was sheer surprise and we felt like a little closer to heaven. In the evening when all the lamps are lit and music played, the lobby of the hotel transforms literally into a festival ground. pigmented with oxides to give that yesteryear feel. Thanjavoor paintings and artwork on granite from Pondicherry. Vayalar is blessed with all the natural beauty, hardly an hour's drive from the heart of Cochin city, the place has got immense potential for development. Vasundhara as part of its corporate social responsibility program has built a new Aganvadi building with all the facility in the vicinity of the hotel. The old building nearby was ill maintained and had a leaking roof. There are more plans in the anvil. Several plans have been submitted to the authorities to root out the weed problem and other plans to make the community in and around Vayalar to prosper. the 8th being Raj Vilas in Jaipur. The Interior Architects, Mr. P.C. Mathew and Ms Monolita Chatterjee have received for VSP the first prize for interiors in the non resident commercial category. If Kerala is Godâ&#x20AC;&#x2122;s own country, Vasundhara Sarovar is Godâ&#x20AC;&#x2122;s Durbar. We spend the whole day exploring the beauty of the resort. P Vasudevan, the managing director of Vasundhara Sarovar Premiere, is a humble person, trying to hide his elegance in his simplicity. He is also the president of India Merchandising Services. 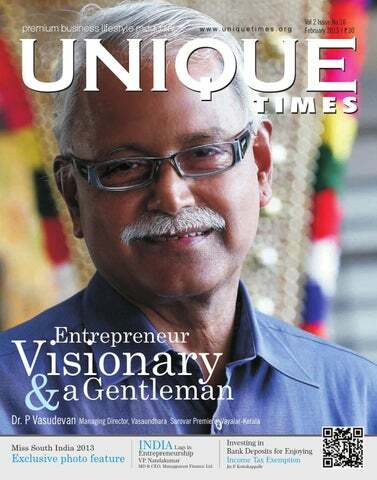 Dr. P. Vasudevan is a pioneer in Handicrafts and Home Textile industry. Government of India has honoured him with a Life Time Achievement Award for his enormous contribution towards the growth of handicraft export. He was instrumental to various artisans becoming accredited exporters of this country. His International Business relations and philanthropic activities rewarded him a Doctorate by Viswaprakash International University. The Income Tax Deptartment has recognized his integrity and honoured him with an "Honest Tax Payer"/highest in his category award. His Agricultural activities made him receive a "Karshaka Shree" award from the Mannarkad Krishi Bhawan, in the Palakkad District of Kerala. here is a 'rag to riches' story behind him. Born in a poor agricultural family he had migrated to Delhi in search of a source for living. Integrity, hard work, determination and practical wisdom got him widespread recognition in the industry as well as society. Once he was the largest buyer of coir products from Cherthala, Alleppey. It was during those journeys to Alleppey, the plan of setting up a resort sprang up in his mind. Vasudevan in a talk with Bejoy George talks about the tourism industry in Kerala, Vasundhara Sarovar Premiere and his life journey. I think we have not fully tapped the potential of Kerala. We need more infrastructure, changes in rules like CRZ to suite the realities of geography of Kerala. I am not saying that rules are not needed, but some adaptations to specific geographies. Can we say that Kerala's tourism success is an entrepreneurial success? Yes and No. In fact the major changes in the tourism landscape were crafted by entrepreneurs, we have all the big names in our tourism industry. But in the recent years the government has provided outstanding support to the tourism industry. I think the government has understood the importance of tourism to our economy, take for example the Grand Kerala Shopping festival and other major events by the government. I think in the future with the kind of support from the government Kerala tourism will go places. journeys I got the idea to start this Resort here. Can you tell, about your idea of Vasundhara? I will tell you something about the place first; this place has all the potential to emerge as a backwater hub like Allepey and Kumarakaom. Vasundhara is being just a beginning and I expect many more resorts to come up in this space so that I have healthy competition. My idea about this resort is to provide our guests a memorable experience, offering them a slice of Kerala, with world class service. What are your expansion plans? We are in the preliminary stages of our expansion. We a planning a resort in Palakkad and adventure tourist resort near Manarkkad. How is the resort doing? This resort I would say is a result of some amazing teamwork, starting from the designers, our builders, contractors, vendors and our staff have chipped in their part to make this a success. We have met with some good success, a good number of guests and some awards too. Yes it is a success story. I have several black marks on my face and itâ&#x20AC;&#x2122;s probably blackhead acne. My parents and grandparents also have it. Is there a cure for it? A. Acne has different stages or types and you seem to have a primitive stage which is marked by formations of blackheads. Acne may be hereditary or caused due to a hormonal imbalance. Try the following steps at home to see if you get results. 1. Steam your face once or twice a week. After steaming, wash your face with warm water. You can use a soft sponge to remove the blackheads. 2. Use a gentle face wash to clean your face. Avoid harsh, drying anti-acne soaps. 3. Do not touch or squeeze the acne, also avoid clogging creams and cosmetics. 4. Eat a well-balanced diet and exercise regularly. Why does hair need conditioning? Conditioning is valuable for dry, brittle, or damaged hair especially for people who use blow driers extensively. Watching your hair closely is the only way to determine whether or not a conditioner is required. If your hair often tangles after shampooing, such products are definite boons. But if your hair is naturally shiny and manageable, be content. With coarse hair, cream rinses are often the best solution, since they relax and soften the hair. With fine & limp hair, heavy conditioners are literal drags on your hair with unappealing results. As with shampoos, you cannot judge a conditioner unless you try it. The fit and finish is comparable to the nearly twice-as-expensive E-class and there’s a genuine luxury feel inside. aluminium trim. Like it or don’t like it the car has got the classiness which is difficult to match by other car manufacturers. The crème leather seats are beautiful and is in contrast with the otherwise dark tone. The steering wheel is a leather wrapped three spoke wheel, the steering wheel is very sporty. The B-Class also features a style of LCD screen and gives a very modern, almost concept car-like feel. The minute you slip in you can notice the quality of the materials used. The B-Class is very not so tall, but it has got a sufficient height of 1557 mm. The Tourer has got a good suspension system also , with a MacPherson strut, wishbone setup up front and a fourlink, wishbone setup at the rear. All four wheels have got disc brakes and the steering is an electrically assisted rack and pinion system. Another unique feature is that the spare wheel is deflated and the car has got electric tyre inflator. The car has got 16 inch tyres and the sports version has got B 180 sports gets 17 inch wheels. placed transversely over the front axle . The engine is made of of aluminium and so it is lightweight. Performance By default the car starts in Eco mode, but if need to know the full performance of this Tourer you need to change it into a performer. The car can touch 100 kmph in less than 11 seconds and touch a top speed of 192 kmph. Mercedes Benz India has brought in the new and dynamic Mercedes Benz B Class Sports Tourer into the Indian car market. The car is not only excellent from the outside, but the engine department here is the highlight. The car is powered by 1.6 litre of four cylinder turbo petrol engine, which would be comfortably produce 122bhp along with generating maximum torque of 200Nm. In Sport and Manual modes you get more control through the paddles and itâ&#x20AC;&#x2122;s fairly responsive and quick acting. Features The car has got some excellent safety features and is a perfect travellers companion. The car has got seven airbags including front and curtain airbags. The ABS consists of acceleration skid control and the electronic stability program provides complete control of the car. To add it features Mercedes Benz B Class Sports Tourer comprise of the collision control system, attention assist, hill and hold descent control, ELR seat belts accompanied by a height adjustment facility, anti theft alarm . The car has also got an engine immobiliser. The Tourer has got an excellent the audio system a navigation system when considering the infotainment department. And lastly In India, every car consumer purchases a car giving high priority to the fuel economy delivered by the car. The new and fresh 2012 B Class Sports Tourer is powered packed with an efficient and powerful 1.6L of four cylinder petrol engine that churns out 122bhp of power and 200Nm of maximum torque. The engine has been unified with a seven speed dual clutch transmission, which pushes the car in delivering a decent fuel economy. This car is a luxury offering, and high class fuel economy cannot be expected from an ultra luxurious car. But still, Mercedes Benz B Class Sports Tourer puts out its best efforts and delivers a fuel economy figure of 11.2 kmpl on the urban roads and 14.8kmpl of mileage on the highway (as per ARAI). he design is different but striking as ever, but the Beat is due to get its first facelift in 2013. As part of the refresh, the Beat will get modified bumpers, a larger honeycomb grille and different wing mirror, apart from tweaks to the front and rear lights. The mechanicals are likely to remain unchanged though. rom its rather unsuccessful experience in India, Fiat now needs fresh products to get customers back. And the Punto Evo could be just the right model to get the ball rolling. With a new front bumper, different grille and reworked head- and taillights, it looks quite different from current Punto. In Europe where the car is already launched, the car has got a new dashboard. he Maruti A-Star is scheduled to receive a fairly comprehensive upgrade in 2013, The new car looks a lot more grown up than the current model. It gets larger and more angular headlamps that flow into a new grille and also different front and rear bumpers. Changes to the cabin are likely to be restricted to new upholstery only, and the K10 engine will power the car. olo sales havenâ&#x20AC;&#x2122;t quite matched up to Volkswagenâ&#x20AC;&#x2122;s expectations in India. VW wants a change. The manufacturer is now readying an automatic version of the petrol car the new version will get a 1.2-litre TSI turbocharged engine and a seven-speed dual-clutch DSG gearbox. The power will also be increased to 104 bhp, not with a price hike of at least 1 Lakh rupees. ou have seen the new B-class in India, then why not a hatchback. Yes the A-Class is also coming, free from its tall boy look, the new hatch look a little more conventional. The car will certainly appeal to a younger customer base and is more aggressive and sporty. Mercedes will equip the A-class with a 121bhp 1.6-litre turbo petrol and a 1.8-litre diesel, both of which will come mated to a seven-speed dual-clutch gearbox. he American SUV icon Jeep now takes a plunge into Indian market. The manufacturer is part of the Chrysler Group is studying the possibility of bringing in the Grand Cherokee. The model for India will be powered by 3.0-litre common-rail V6 diesel engine that will come mated to a fivespeed automatic gearbox. It is expected to be priced less than 40 lakhs. Books Money Mantras: Your Guide to Financial Success (Hardcover) Author: CNBC TV18 Publisher: Network18 Publications (2012) Rs. 151/Striving for financial success can be as simple or complex as you make it. There are those who will swear by investment models based on intricate mathematics and others who will tell you that investing is all about applying common sense. Fortunately, the latter view is held by most financial gurus of this era. From time to time, and through different mediums, they have testified that doing ordinary things in an extraordinary way have yielded results. And that is exactly what Money Mantras Your guide to Financial Success teaches you to do undertake regular financial actions and look at everyday financial quandaries from a fresh perspective, so that they deliver more efficient results. Spot the Next Economic Bubble (Hardcover) Author: Saurabh Thirani Publisher: Network18 Publications (2012) Rs. 699/The Great Depression of 1930 was the longest and deepest recession in history. Unemployment soared, incomes fell, banks failed, and wealth was destroyed. But how is that relevant today? Unfortunately history has an uncanny knack of repeating itself... and it is just about to do so. Free-market thinkers from the Austrian School of economics had warned us about the Great Depression, the dot-com bubble, and the US housing crisis of 2008. This book uses their theories to examine the structural weaknesses across the world that point towards a major economic meltdown. Everything You Wanted to Know About Business & Economics (Hardcover) Author: Rommel Rodrigues Publisher: CNBC (2012) Rs. 499/For those who have forever grappled with the scores of elements of business, economics and finance, this book EVERYTHING YOU WANTED TO KNOW ABOUT BUSINESS AND ECONOMICS by Rommel Rodrigues comes as an illuminating encyclopaedia which will step-by-step teach you almost every component of complexly arranged terms that is commonly used and employed. Starting from a brief history of genesis of economic principals, economy of India and extensively covering topics like budget, trade & industry, stock markets, financial markets, investments, banks & savings, the book takes you through the entire lexicon of this domain in a very easy & light read mode. Build, Borrow, or Buy: Solving the Growth Dilemma (Hardcover) Author: Laurence Capron, Will Mitchell Publisher: Harvard Business Review Press (2012) Rs. 995/How should you grow your organization? It’s one of the most challenging questions an executive team faces—and the wrong answer can break your firm. The problem is most firms’ growth strategies emphasize just one type of growth—some focus on organic growth, others on M&A. When these strategies falter, the common response is simply to try harder—but firms falling into this “implementation trap” usually end up losing out to a competitor whose approach is more inclusive. to become the voice of India. All these she had heard from her affectionate father-in-law. She mentions how the talent in Mohd. Rafi was spotted and how he went on be trained by great legends of Hindustani music. Rafi’s arrival in Bombay and his foray into film music is recollected. Yasmin who herself a great admirer of Rafi’s song attempts to recollect the story behind some beautiful songs that Rafi had sung. And there she would tell us about Rafi’s friedships with Naushad, Shanker-Jaikishen, S D Burman, Shanker Jaikishen and O P Nayyar. It was the associations that brought to us many wonderful songs like O Duniya ke Rakhwale (Baiju Bawra), Baagom mey Bahaar Hey (Aradhana), Ye Zindagi ke Meley (Mela) and ilk. She would very fondly tell about the effort that Rafi Saab would try to make the songs beautiful. The best thing here would be that the author mentions a huge list of songs that Rafi has sung even though no analyses of the songs are made. Also recollected is the specifics about the honors that he had got. The book being a memoir is of course written by someone who should have written it, a great fan and a fond daughter –in law. In the preface she would tell how strangely a great fan of Rafi Saab became the family member and would eventually write this memoir. It came out first in Hindi and now Tranquebar has come with the English translation. Written in a very personal style sometimes emotions seem to hinder the flow of the book. Here and there one can feel it’s too congratulatory. But otherwise the book has been beautifully written and translated. The book will be of much interest to admirers of that golden age and golden voice. Yasmin would also tell how very slowly Rafi became very busy with his stage shows towards the end as new singers were entering particularly Kishore Kumar. Yasmin gives us more about Rafi the family man, his likes, passions, hobbies and how he was to everyone around him in his family. Miss South India The finale of Manappuram Miss South India 2013, was organized in the Lulu convention centre, Thrissur on the 9th of January. In the event which was marked for its splendor and celebrity presence, Anusha Venkataraman from Chennai walked away with Miss South India title. The first runner up was Ms Sharu Varghese from Allepey and the Second runner up was Ms. Ankita Naik from Karnataka. Miss world runner-up Parvathi Omanikuttan, South Indian actors Babu Antony, Sajimon Parayil, Toshma Biju, Ranjini, Nikitha Narayana and Aiswarya Dhawan were judges for the show. xpecting life to treat you well is like expecting an angry bull not to charge on you just because you are a vegetarian! Anusha Venkataranman who describes herself to be an extreme extravert individual is a dancer, a model and was recently crowned Miss. South India 2013. Growing up in Chennai, her father Mr. Venkataraman, mother Meena Venkataraman, and older sister Suhsmita played the role of being her role model in life who has allowed her to be however she pleases to be yet help her learn many of the lessons which life helps one learn. Denisha Sahadevan chats with her to find out what it was like to win Miss. South India 2013. The role of a beauty queen/model along with several others is also that of a role model for the younger generations today, how easy or difficult is that task? All tasks come with responsibility. One should be aware, and willing to take up the same. A role model must be able to motivate and lead people in the right direction no matter what it takes! What was it that drew you into the world of beauty pageants? think twice about jumping into something you're passionate about! I've always loved the stage and I think it's remarkable how a beauty pageant brings out the best in women. Do you think that it is the inner beauty or the outer beauty which is more important? How is Miss. South India different from other beauty pageants? I think what the inner beauty brings is what translates to your outer beauty. The inner beauty brings out the true meaning and expression. 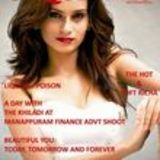 I think Miss South India is different from other beauty pageants as it does not include the Bikini round. India is a country known for its rich tradition and culture and not many women are comfortable in exposing their body in order to display their beauty. Therefore this contests does not restrict any woman who wants to be a model by allowing us to dress and present ourselves in a manner we are most comfortable. How different was the stages/rounds in the contest? We were judged on different criteria. Our overall personality was taken into account. Our walk, our confidence and clarity in introducing ourselves, our interaction with judges and the written round (we needed to express our mind in sixty seconds!) The judgment was also based on how comfortable we were in carrying out ourselves and most importantly if we carried out a genuine smile. How meticulously was the pageant organized? The pageant was so well organized that it made it so easy for us to just focus on ourselves. The rest was well planned and very neatly executed. When you were younger what was your career objective? What is the most thrilling thing about part taking into a beauty pageant? You discover an entirely new side of yourself. How did you get into the world of modelling? I started doing advertisements when I was younger. From then on I have always opened myself to all opportunities. You never what your calling is! You are a Bharathanatyam dancer, how long have you been dancing? What is it that you love the most about dancing? I've been dancing since the young age of 6. As Shakespeare once said "All the world's a stage, and all the men and women merely players.â&#x20AC;? I absolutely love how dancing constantly makes you play some role on stage, become some character, and lose all inhibitions while performing under the spotlight! I don't have a role model in particular but there are many people I truly admire and look up to. My Parents and elder sister to begin with. I absolutely respect how they give me the freedom to make my own decisions in life, but at the same time make me realize the consequences of my every action! My uncle, Mr. R Natraj (Former DGP ) has taught me the true meaning of selflessness and to not just dream, but to DREAM BIG (of course one should work towards living the dream). I appreciate and admire something in every person and that helps me constantly to grow as a person. Where do you hope to see yourself in 10 years from now? I don't plan too far. I think I restrict myself to one plan, and then I would never drive where the road takes me! What did it feel like winning Miss. South India? What was going through your mind at that moment when they announced you to be the winner? I was pleasantly surprised. Each one of the contestants were versatile and talented having an equal chance of heading home with the crown. When my name was finally called out all I could say is the rising levels of tension was finally put to rest. When I was actually being crowned as Miss South India 2013, at that very second I truly felt like I was the queen of the world!!! ou are what you dress, and how you dress is how people will perceive you. With a clean cut stylish look you carry a sense of power and you are able to obtain confidence. Many youngsters these days have their own fashion which they prefer to sport rather than the traditional suit and tie, and as for the older generations well, they have the old school style at times however as the years pass some may lose interest in being in tip top shape for the office every day. So what is the focus here? How to dress properly so that you can catch your bossesâ&#x20AC;&#x2122; eye for the next promotion, yet in style so that you still have the ladies heads turning as you walk by. First men, when it comes to dressing for the office remember putting together the office look isn’t as simple as putting together the simple t-shirt and jeans look. It requires a certain sense of thought and the ability to contrast the colours. And keep in mind even in wearing a suit or the formal office look there is mix n’ match. When it comes to wearing dark pants, always stick with the black. It’s just safe, because black goes with any colour at most times. But gentlemen make sure to NEVER put together a pair of black pants with a black dress shirt for the office save that for the formal evenings. Otherwise it’s best to pair the black shirt say with a pair of cream or white colour dress pants. If you are more interested in wearing patterns, keep in mind that certain patterns may have the tendency to make you look older than you are or for men on the plumier side a little more overweight than they really are. However for the youngsters, who are drawn towards this old style look of patterns, make sure you know how to wear it, which is basically with confidence. When it comes to suit coats, it has to be simple and spick, only then will you have a clean look. Make sure that it is fitting, and the hand is the perfect length. And to bring attention to the perfect hand length of the shirt, match it with a nice pair of expensive simply looking silver, black or gold cufflinks which you can make statement with. Now when it comes to certain types of tie, here’s how you play it. The dark tie should go with the light coloured shirt. The light tie vice versa with the dark coloured shirt, learn to play around with patterns though when it comes to ties. Express or make a statement with the tie, but don’t overdo it. When I say don’t overdo it I mean don’t go buying ties with clowns and crazy images like Christmas trees for the season. When it comes to the type of shoes, pair it with the classic black, or brown depending on the suit colour match it. When it comes to light dark navy blue coloured suits, you can wear the dark coffee brown leather dress shoes, otherwise here’s the tip to remember: black is always the safest colour to stick with especially when it comes to the pair of socks which you wear with your shoes. Don’t go wearing thick boyish white socks, it’s just too retro. Approach life like a child I always wonder why people make this world this much complex and life so complicated. Is it lack of compassion or is it lack of empathy. What’s that thing that makes our lives loaded with complexities. The answer, we fail to see the world as a child would see it. We never try to approach our lives with the innocence of a child. We are good at preaching .Not practicing…. Teacher was determined to get an answer from them she asked, “If I give candy to all kids. Loved every one in my family and neighborhood, will I be able to go to heaven”? Teacher got again a big ‘No’ from them. Finally, she asked,’well, children then how can I get into heaven?? We coolly tend to forget of what we have to do here.At the same time; we are so sure of what we have to get from here. Suddenly a five year old boy shouted in an excitement, “You got to be dead to go to heaven”"
The following story would drive my point clear.listen. This is what happened between a Sunday school teacher and her kindergarten class. That day, the teacher did a class on ’salvation’ for the children...In the end; she wanted to test them.hence started asking questions. The teacher asked,” If I sold all my valuables and gave all the money to the church, would that get me to heaven?” NOOOOOO. children shouted happily. Ok, the teacher went on.”If I do social service in my locality, will that get me to heaven’? I found a wonderful theory in this joke or a story. That is, you have to do your part well before you harp on what you want from here. In sum, each one of us has to concentrate on our duties and responsibilities.do it with utmost dedication and commitment…And whatever you do.do it with passion and complete involvement.Who can deny your rewards then..?? Self Appraisal A little boy went to a drug store and proceeded to call someone…The store owner observed and listened to the conversation.. Boy: - Lady, can you give me the job of cutting your lawn? Lady:- I already have someone to do the job. Boy:- Lady,I”ll cut your lawn for half the price of the fee of the person who does the job now. Strength lies in differences not in similarities Once colors of the world had a big quarrel …All claimed they were the best, most important, most favoured, most useful and so on. Green said,” I am the color of nature.sign of life and hope’. Blue quipped,” I am the color of sky and sea-the basis of life” Yellow chuckled,” I bring laughter, gaiety and warmth-color of fun” Orange spoke softly, “I am the color of health and strength” Red shouted, ‘I am the color of blood...life’s blood” Purple spoke with great pomp, “I am the color of authority, wisdom and royalty.” Indigo finally spoke with determination, “I am the color of science, without me you become superficial.I give balance and contrast. Lady:- I am very satisfied with the person who works for me. Boy:- I’ll even sweep your car shed and your side walk..So, on Sunday you will have the prettiest lawn in the locality. Colors were frightened...they slowly came together and stood closer comforting each other. With a smile he put the receiver on the cradle. The store owner suddenly quipped…… Son, I like your attitude and positive spirit…I would love to offer you a job. Boy: - No, thanks... Shop owner said “”but you were really pleading for one over the phone”"… Boy: - Oh No, Sir, I was checking my performance at the job I already have. I am the one who is working for the lady whom I was talking to. Is this what is called “self appraisal”? suddenly, there was thunder storm... thunder rolled and boomed. Finally, torrential R...A...I.N…S. The Rain spoke,” You foolish colors, stop fighting...Don’t you know each is made for a special purpose.each is unique and different. Join hands with one another and come to me. Colors united and joined hands. Rain continued, “From now on, when it rains, each of you will stretch across the sky in a giant bow of color as a reminder that you can all live in peace. Know that Rainbow is a sign of hope for Tomorrow.” Whenever a good rain washes the world, and a rainbow appears in the sky, let us remember to appreciate one another... Acknowledge and accept others as they are. That’s our strength. Jim Stovall has put it this way; ”You need to be aware of what others are doing ,applaud their efforts, acknowledge their success and encourage them in their pursuits .When we all help one another, everybody wins.” Remember, strength lies in differences not in similarities. Let us stretch across and form a Rainbow, the sign of HOPE… And a make this world a wonderful place to live in Peace.